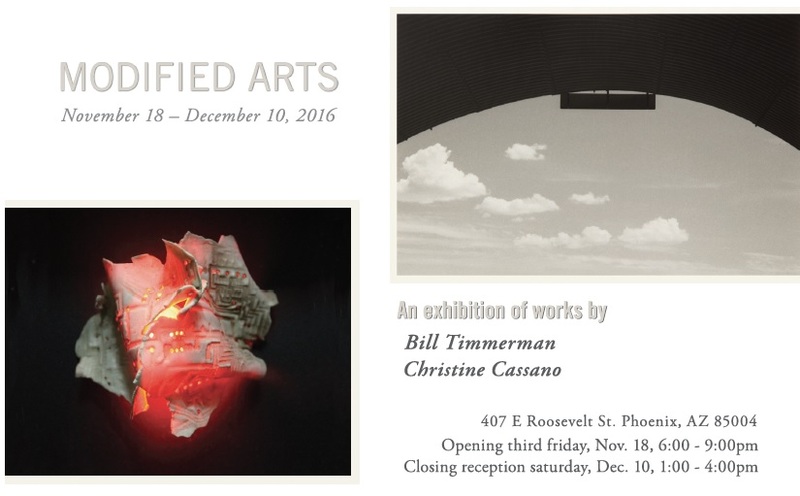 Modified Arts is proud to present the return of two of our most in-demand artists, photographer Bill Timmerman and sculptor/mixed-media artist Christine Cassano. Christine Cassano’s work across her career has spanned all manner of sculptural materials, merging biological and technological forms to create something neither entirely human, nor entirely robotic. Her latest body of work centers around “the future imperfect.” Using fabrication and concretization, Cassano creates glowing synthetic skins atop post-industrial solid forms, creating a kind of ancient-retro-futurism. Each piece questions the influence of the natural and unnatural on our evolution, socially and physically, forcing the viewer to reflect upon what will remain of their own era. Cassano is a 2016 Contemporary Forum grantee from the Phoenix Art Museum, recent resident at the University of West Georgia, and is part of the traveling Southwest Invitational and the last two Tempe Center for the Arts biennials. Together, the physicality of Cassano and Timmerman’s works shine. Each find themselves ruminating on the impact of man on the built environment, and how that built environment affects routine and remains. Though opposing in media, the two’s work melds seamlessly to create a physical, interactive exhibition yearning for an audience.